I recently spent 11 days in India. That's 11 days of pulsating streets, tranquil jungles, vibrant colours and my eyes wide open with fascination. It was my first visit to India, so I chose our Glimpses of Taj & Tiger Journey as a great introduction to the country. My visit, and the itinerary, didn’t disappoint. In fact it exceeded my every expectation and smashed every stereotype I'd had. Upon returning, here’s what I think everyone should know before travelling to India. I know what you’re thinking because I thought it too. Having never visited a third world country before, I was anxious (as usual) as to what I would see and experience in India. In the past I’d heard stories of beggars, thieves and smelly streets. So as soon as I set foot outside Delhi Airport I braced myself for the deluge. Instead I was met with a smiling man holding a sign with my name on it. He welcomed me and my friend with garlands of marigolds and escorted us to what would be our car for the trip. 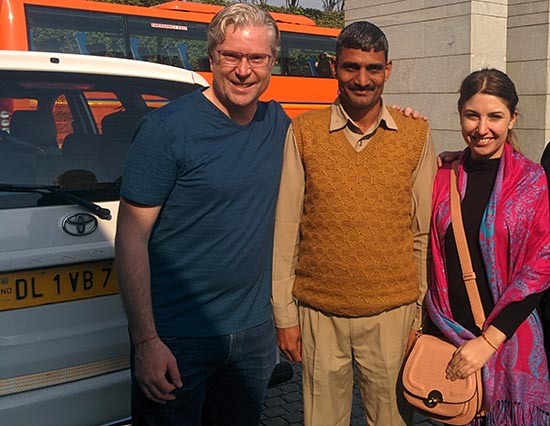 From that moment onwards I was completely at ease in the hands of my tour manager Taj, and private driver Kahlee, both from our in-destination partners Creative Travel. With them as our guiding light around India and its culture, I was able to relax, travel confidently and truly enjoy the ride. Having a driver in the UK is an extravagance left only to the very rich and toffy, but in India it’s a practicality of middle-class life, along with a maid and a cook. All of our India holidays include the service of a driver, and it’s one you will no doubt be grateful of. Firstly because the roads are so magnificently chaotic that I needed Taj to help me just cross the road, let alone drive on it. And secondly, India is one of the most fascinating places to see by road. Having the flexibility to ask Kahlee to pull over so I could take a photo of a lady herding goats in the countryside (yep), or asking him excitedly to stop so I could take a photo of a groom on the way to his wedding on an elephant (happened more than once), was amazing and something you won’t get if you’re doing it yourself. Sure, India is a cheap and cheerful destination to backpack around, but if you’re past the age of dirty hostels and questionable hygiene (aka over 25), then India is a destination you’re still going to love. As I happily discovered, no one does luxury quite like India. At every hotel we stayed at I was blown away by the service and accommodation. My room at the Le Meridien in Delhi was wonderfully modern, spacious and plush. 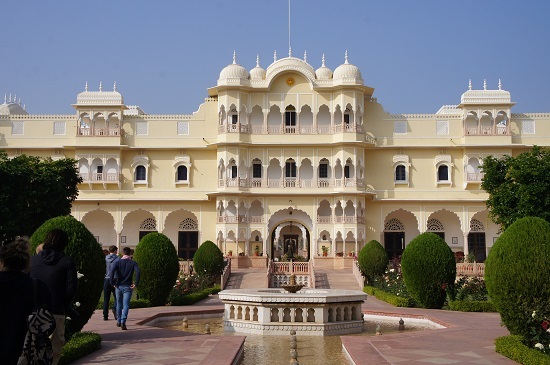 In Ranthambore I was surprised to find our hotel, the Nahargarh Fort, was actually a palace complete with decadent dining hall, four poster beds and a room to rival the size of my London flat. Everywhere we stayed the staff were also incredibly attentive (I enjoyed the novelty of being called ‘ma’am’) and I adored the welcoming ceremony we were treated to at every hotel. For all of the stories I heard about India, this was the most common one, and the scariest. To play it safe I vowed to become vegetarian for the week, avoid fresh salads and stick to only sparkling water (as I was told this was the only way to guarantee the water was safe). But as soon as I saw the buffet at the Le Meriden in Delhi, this pretty much went out the window. 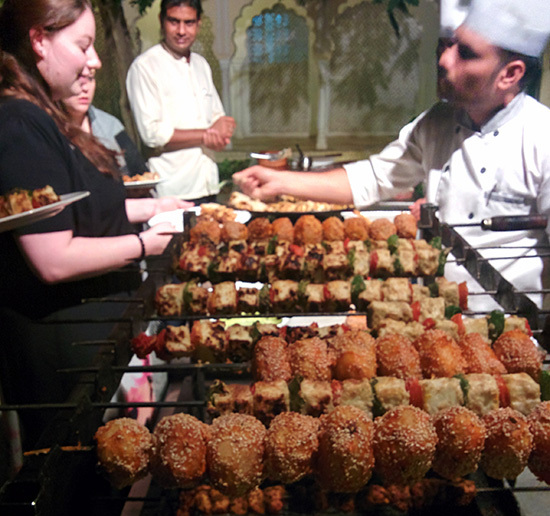 I didn’t hold back from the barbecued meat at the Nahargarh Fort either and I had the most delicious salad at the Trident Agra. It may just be my experience, but I feel that all of the Delhi belly rules are the result of people not being vigilant about what, and where, they eat. If you stick to the hotel restaurants you are staying at (also because they’re delicious), then you should be fine. When it comes to water, your driver will have a stash of water bottles in the car, as will your hotel room, so you’ll never be caught out and need to buy one from a street stall. I was expecting people to be everywhere in India – and they were – but I wasn’t expecting animals to be everywhere too. Even in Delhi, a city with over 25 million people, the wildlife still caught my gaze, from monkeys to tiny squirrels to an abundance of birds. Then of course there are cows, goats, camels, horses, pigs and elephants that you’ll typically see alongside the roads – or sometimes even on the roads, depending on their mood. In Ranthambore National Park, where we enjoyed three game drives, the park completely burst with wildlife; deer, antelope, wild boar, monkeys, sloth bears, leopards and peacocks. The jewel in the jungle's crown though is sighting a tiger, which we were incredibly lucky to do. 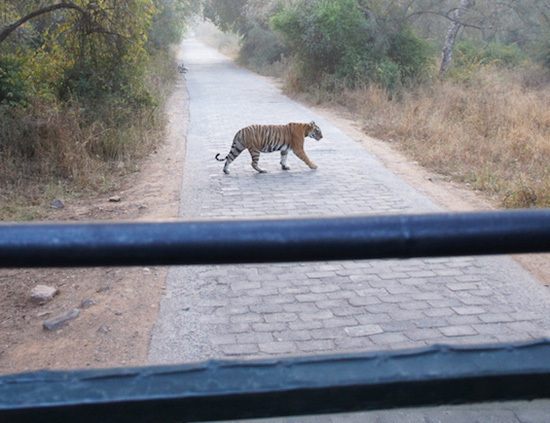 We’d just entered the national park when, out of nowhere, a mother tiger walked out from some shrubbery to the road. Our jeep screeched to a halt and we watched in awe as it walked right beside us before crossing the road and disappearing into the jungle again. 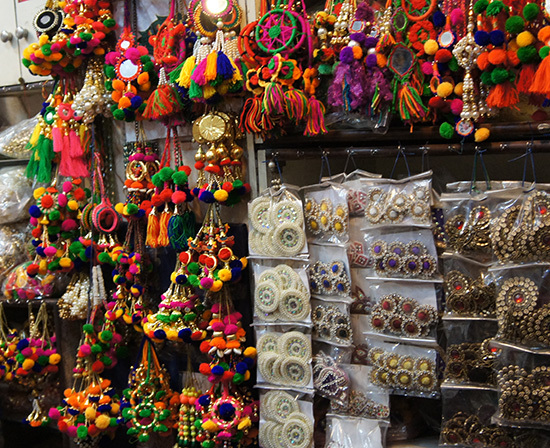 If you’re a fellow lover of sparkly jewellery, intricate homewares and colourful scarves, then I recommend bringing some spending money to India. Incredibly, you won’t need much. I paid £5 for a vibrant shawl at Connaught Place in Delhi, and £25 for a block-printed silk and cashmere scarf from a trader in Jaipur (one that Creative Travel recommended and I was able to haggle with as well). All in all I bought five scarves, two pyjamas and one elephant statue. I could have bought more but I had to stop myself. If I could have my time again I would have spent more time exploring the shops of Old Delhi. I guess I’ll just have to go back? I had braced myself to see a lot of poverty and sadness in India, and while I did see poverty, it wasn’t as sad as I thought. It was just a different way of life. With the majority of the population being Hindi, Taj explained to me that as they believed in karma, people tried to make the most of what they had. I saw it for myself when I visited a home in the countryside. While the living was very basic and free of the luxuries of modern life, the inhabitants – an extended family – were happy and welcoming. 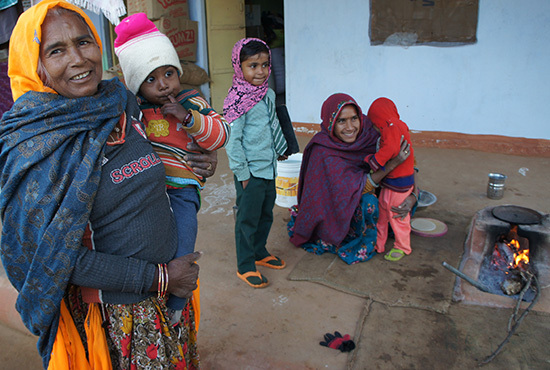 The kids wanted to test out their English with me, their grandmother joked about swapping dresses with me while their mother cooked naan on a traditional stove and even sweetly offered me some. Mingling with the locals was one of my favourite parts of the trip. A humbling and uplifting experience. I love exploring a place on my own, deciding what to do the day before and just winging it. India though, isn’t really a place that you can just ‘wing’. Firstly because it can be quite difficult to work out what to do without a full-on thesis of research, and if you get it wrong it can mean a day gone to waste. My friend, thinking he’d done all of the research, went to visit the Taj Mahal on a Friday only to find out it's closed that day! Knowing the wheres, whens and hows of India is a balancing act best left to a local, which is why seeing India with Taj from Creative Travel was so fantastic. As it was just my travel partner and Taj, I was able to enjoy the benefits you would get with a knowledgeable guide on a group tour, with the flexibility of travelling solo. It was the best of both worlds and as a result I really felt like I saw the best of India. Visit India on one of our tailor-made India holidays which include flights, accommodation, experiences and a tour manager from Creative Travel.